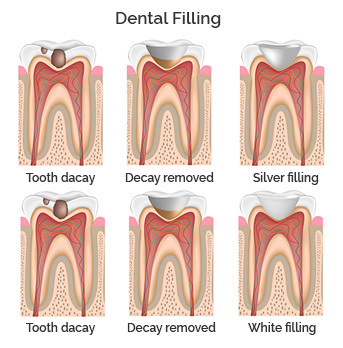 During a filling procedure, the decayed tooth material is removed, the affected area is cleaned and then the filling is placed in to the cleaned out cavity. The filling is then smoothed and shaped accordingly. Fillings are made from a number of different materials. Traditionally, all dental fillings were silver based amalgam, This is still used routinely today for fillings in back teeth due to its strength and resistance to wear. The amalgam filling contains mercury and many people therefore choose alternative filling materials. White fillings have developed quickly over recent years and can now offer an alternative to silver fillings. They physically bond (glue) to tooth enamel to form a seal with the tooth and are set hard immediately. We have a choice of colours available and improve anatomical guides produce fillings to a very high standard. White fillings on back teeth take twice as long as silver fillings to place and require more care to ensure the tooth is kept dry while bonding to it. This is the reason why they are only available presently on a private basis. Occasionally, there may be too little enamel remaining to place a white filling. In such cases, we will advise placement of a white crown instead. Your dentist will discuss your options with you before starting treatment. Should you wish to have white fillings instead of silver amalgam, please ask your dentist for a treatment plan and costing.